First of all, here is the story via Twitter. Last night, the Angels encouraged their fans to do a #LightWave during the game. What is that? Apparently it’s asking fans to use their lights on their phones to distract the opposing batter. It happened last night when Stephen Vogt was at the plate with the bases loaded. And fans followed through on that. It started last month and it’s just silly. Roger Goodell admitted that his decision to punish Ray Rice for only two games for beating his fiance was not good enough. In turn he has implemented a new rule for every NFL employee that a first offense will now warrant six games. A second one will lead to a lifetime ban. I am happy that Goodell finally saw that the punishment he handed Rice was not strict enough, that a domestic violence situation should warrant a harsher punishment. But is six games enough? It’s tough to say since these kinds of things can get dragged out in court and sometimes cases are dropped. Should the punishment be more strict? There’s a certain balance between tolerance and forgiveness. The NFL is a forgiving league and giving a player a chance to come back is a good policy. But should the first offense punishment be harsher to be a bigger deterrent? I think at least a full season ban would suffice. You have to show that this kind of behavior is a serious matter. 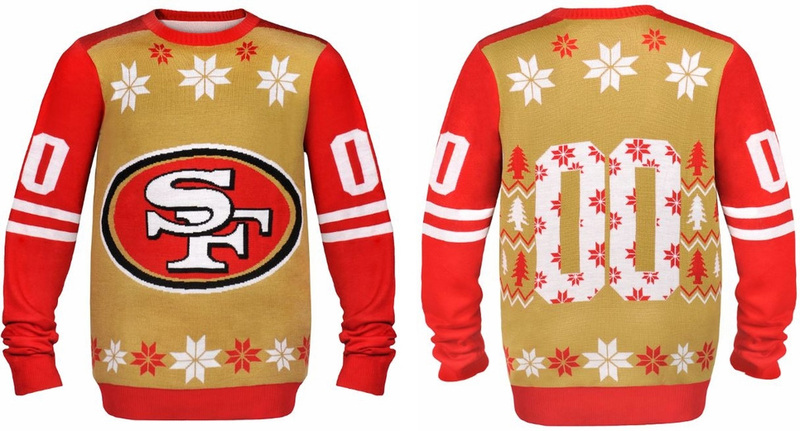 I wasn’t sold on the previous two 49ers sweater designs. However, this new one is perfect for me. Remember when they announced the ugly NFL sweaters? Well, it looks like we have ourselves some new designs released just in time for purchase before our eggnogging drinking days. Check out these new designs. They don’t have designs for all the teams, but the looks are similar. The front has the team logo. The sleeves color (with sleeve stripes and numbers) contrasts the body of the sweater. On the back is a number which is just filled with complete unnecessary snowflakes. It’s ugly. It’s perfect. As a 49ers fan, I wanted these but the two previous designs were just OK with me. This one, however, I really like. I think I am getting it. Check out their selections right here. What I like about these new Blues uniforms is that they look nothing like their old set. Removed are the unnecessary pipings and the odd color placements. Instead it’s a simple classic look that is similar to what they wore before Reebok Edge took over. Sometimes simplicity is the best and the Blues nailed it. It’s a jersey you’d be proud to wear. Good job! Another year of fantasy football. I don’t expect to have all the answers and some of these suggestions could be completely wrong. But I will impart my wisdom among you. It’s up to you if you want to believe my advice to be of any value. I may be completely wrong. Good luck in fantasy football this year! 1 – Broncos offense will be on fire again. Let’s take a look at this offense right now. They didn’t really get worse. The loss of Eric Decker isn’t a huge hit but the potential growth in Montee Ball could be huge. Peyton Manning is still playing at an elite level and the receivers are still very good. I don’t thin the Broncos will repeat the same offensive numbers they did last season but I don’t think they will tail off that much either. If you get a chance to grab a Broncos offensive weapon, do it. Even kicker Matt Prater is the top kicker in the league in my opinion. I think at this point, you should look at how early you want to get at least one of the receiving weapons. It would be a good investment if you did. Just give us Weird Al. This is ridiculous! The National Football League is planning to introduce at least one significant change to its halftime show at the Superbowl: in order to perform, superstar acts will pay for the privilege. The news was not received well in some quarters, but some met it with more humor than others. And so, we bring you: the 6 best reactions on Twitter to the NFL’s new “pay to play” scheme, based on no scientific rubric at all and entirely on this writer’s whim.